I was provided with an ARC of this book and voluntarily decided to provide a honest review. well what can I say? I initially read this book as a part of the shattered world's boxed set, however as it was smack bang in the middle of the book I didn't leave a review at the time. I thoroughly recommend reading this book in the reading order that it was released in, as otherwise some characters and ideas will not make sense. that being said, I enjoyed this new, fresh perspective that Logan has brought to the life after series - until now it has been the Audrey show, and while that was not a bad thing, the new perspective shone the book in a new light. 5.0 out of 5 starsOh Logan, my Logan! 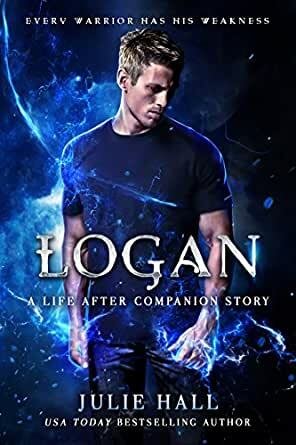 This novella installment in the Life After Series was an intriguing look into how Logan became the closed off and slightly cynical man we'd seen in both Huntress and Warfare, giving some much valued insight to his nature. I can't say enough good things about this short story, it fills holes and answers so many questions about MANY characters we've met throughout the series, making me just that much more anxious to get Dominion into my greedy hands! The commentary and bloopers are a fun touch and I love seeing the author in this light. I love getting to know the other characters of a series. This book answers a lot of questions about Logan and uncovers some of the mystery behind him and his actions. That being said, if you enjoy the mystery and suspense I suggest reading Huntress and Warfare first. If you choose to read Logan before Huntress, know that some of the mystery will be taken away. This is clearly stated in the book's Preface. I enjoyed the mystery of Logan during Huntress and Warfare. Since I read Logan after the first books in the series nothing was spoiled for me, Logan's actions during those books became more understandable. Logan A Companion story is excellently written and adds a lot of depth not only to Logan but to Kaitlin and Morgan as well. I really enjoy this series because while it does talk about God and the afterlife it is not pushy about it. She is not trying to convert anyone to Christianity or saying her beliefs are better than others. I hope to be able to get to know the other characters as much as I have gotten to know Logan and Audrey. Dominion is sure to be one heck of a book, I can't wait to see where the series goes from here. LOGAN is a sort of prequel to the Life After series told from the perspective of... you guessed it... Logan. It was so awesome to get to know more about Logan. He's so mysterious and keeps a lot of himself hidden in the full length books, so I loved getting this peek into his head. I really enjoyed getting a look at what Logan's life was like pre-death and then the beginning of his afterlife. And it was great to see more of his and Kaitlin's friendship. LOGAN is a great read to hold me over until the release of book three, DOMINION, but it can also be enjoyed even if you haven't read the LIFE AFTER series before. (Although you might get even more enjoyment out of it if you've read books one and two beforehand.) It did take me just a little bit to get into, which was probably just me getting used to Logan's POV. But it really didn't take long before I was reading as fast as I could and then being super sad because it ended. This whole series is amazing and I can't recommend it highly enough! 5.0 out of 5 starsSo much fun to hear the author share while reading! Oh my goodness, it was so much fun to hear the author share more about the book! Originally, I gave the book four stars, but with the fun interaction from the author, I’m changing that to 5 stars. Definitely a must read for that alone, though this is a great companion for Life After fans! A lot of lingering questions about Logan's past and how he used to be are answered as well as a few extra tidbits about his life that were fun. I didn't quite expect to enjoy his POV as much as I did and want to reread the series with fresh eyes since getting to read more of his story. Overall, this is a great, must read in the series that will put Logan in a new limelight. Plus, the book is worth an amazing deal just to have an inside scoop from the author while reading each chapter. 5.0 out of 5 starsThe backstory we've all been waiting for! If you've enjoyed Huntress and Warfare (and, come one, who *didn't*?) then you're gonna love this. Julie expertly peels back the layers of mystery and intrigue that have surrounded the Life After series' most secretive character. And it. Is. GLORIOUS! We finally get to understand more about Logan's motivations, but more than that, we also gain insight into other vital characters like Kaitlin, Morgan, even a bit of Satan himself. All of this is pivotal to a deeper understanding of the series as a whole. Naturally, because of this, there be spoilers! If you haven't read Huntress or Warfare prior to this book, there's a lot you may miss out on. While I realize it could potentially be read as a standalone novella, it really is best read as part of the series. Reading this book by itself would be like having a diamond without a setting. Sure, it wouldn't still be beautiful, but it wouldn't be nearly as practical or complete. The bonus features (Julie's commentary videos and the recommended music playlist) provide an immersive experience into Logan's world, with all its ups and downs. Plus...who doesn't love a good commentary? If this book does nothing else for you (which isn't even remotely possible because it's that good), it should, at the very least, whet your appetite for Dominion. I know I can't wait to see what comes next for my favorite demon hunters!